Raspberries finally appeared at the Farmers' Market last week. You can imagine my reaction- I immediately bought far more than I needed. This is a regular occurrence around here - when you go so long without fresh, local produce you celebrate in a bacchanalian way when it appears. Happily the folks at Eating Well mush have sense my raspberry overload because this recipe appeared on my Facebook feed. I've learned that a recipe from Easting Well means lower sugar,lower fat, and likely more healthy ingredients. This one doesn't disappoint with whole wheat four, a third off the sugar that I found in other muffin recipes, lower fat and more healthy fats at that.If you're going to have a muffin then this is a good choice. This recipe was particularly good for me as it combined raspberry and lemon - one of my all time favourite flavour combinations. Each bite is bursting with fresh raspberries and a splash of lemon - what is not to love? You can see from the picture that I made them a tad less healthy by sprinkling some granulated sugar on top of the muffins prior to baking. Our CSA has had a regular supply of organic strawberries and I have been looking for creative ways to use them up. I also had some bananas that had gone over to the dark side of ripeness. Some folks may not know this but strawberries and bananas are one of the great fruit combinations. 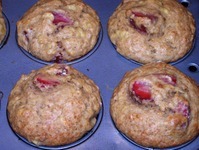 Igoogled about a bit and found a recipe for strawberry banana muffins. Muffins belong to the 'quick bread' family and these Strawberry Banana Muffins are quick to make. Just two bowls are needed; one for the wet ingredients and one for the dry. Combine the two ingredients together, using a light hand, and your batter is made. If you want giant sized muffins then this batter will make six. Otherwise you will get 12 regular sized muffins. Just remember that if making giant muffins you will have to increase the baking time by at least 5 minutes. They are done when a toothpick inserted into the center of the muffin comes out clean. We LOVED these. 6 were eaten up rather quickly and I stuffed the remaining 6 in the freezer to enjoy with a cup of coffee at a later date. Preheat oven to 350 degrees F (177 degrees C). Place the oven rack in the center of the oven. Line a 12 cup muffin pan with paper liners or lightly butter or spray the muffin cups with a vegetable spray. In a medium sized bowl whisk together the eggs, vanilla extract and mashed banana. Add the melted butter and stir to combine. In another large bowl combine the flour, sugar, baking powder, baking soda, cinnamon, and salt. Gently fold in the berries, making sure they are coated with flour. (This helps to prevent the berries from sinking during baking.) Add the wet ingredients to the dry ingredients and stir only until the ingredients are just combined. Do not over mix the batter or tough muffins will result. Divide the batter evenly among the 12 muffin cups, using two spoons or an ice cream scoop. Place in the oven and bake until a tester inserted in the center of a muffin comes out clean, 20 to 25 minutes. Transfer to a wire rack to cool. Can be stored for a few days at room temperature. Cleaning out the fridge is a pre-trip ritual. It has been relatively easy this time because I've been so busy with work that we have taken to not buying groceries and just taking containers of leftovers out of the freezer, tossing them in the microwave, and chowing down. I did have a bunch of bananas which were getting decidedly 'ripe' so we made these muffins. Quick and easy to pull together we loved the flavours and texture. If you have some ripe bananas needing to be used up you won't go wrong with these! Preheat oven to 350°F. Grease 12 muffin cups or line with muffin papers. Sift first 4 ingredients into a large bowl. Combine bananas, sugar, butter, milk, eggs and vanilla essence in a medium bowl. Mix into dry ingredients until just combined. Do not over-mix! Divide batter among prepared muffin cups, fill it till 3/4 full. Bake until muffins are golden brown and tester inserted into center comes out clean, for about 25 minutes. (10 to 15 minutes for miniature muffins). Cool muffins in tray for 5 minutes before transferring muffins to cooling rack to cool completely. . . .or I finally use up the last of the buttermilk I bought a few weeks ago . . .
Why is it that all milks and creams come in small sizes BUT buttermilk? ARGH I still had a carton of buttermilk in the refrigerator and I was determined to use it up before it went bad. I also went crazy at the market last week buying strawberries and rhubarb. There are times I wonder if I should be allowed in the market unsupervised since I always come back with WAY more than I need. We wait so long for fresh strawberries here in Ontario so that when they arrive I can't help myself. Of all the fruits I think strawberries are the biggest argument in favour of local, fresh, and ripe or NOTHING! I had made buttermilk pancakes last weel with strawberries so that was out. I had planned a cobbler but that never happened. I googled 'strawberry rhubarb buttermilk' and some interesting sounding treats popped onto the screen. I ended up selecting a recipe and then played around with it . . . because that is what I do. *smile* I added some cinnamon to the batter and wanted a bit of a crunchy topping. I also cut back on the sugar. The results were brilliant! So brilliant that I may need to buy more buttermilk so I can make these again . . .
Place paper liners in your muffin pan and preheat the oven to 375F. Prepare the fruit. Rinse, hull, and cut strawberries into small pieces. For rhubarb, cut off any ugly ends and using a paring knife, peel off tough strings. Cut into small, 1 inch pieces. Toss the fruit with 1 tbls. of flour and ½ tsp of cinnamon..
Cut the butter into pieces and, using an electric mixer, cream with the sugar and salt until it is light and fluffy. Continue to beat and add eggs, one at a time. Add flour and baking powder. Add buttermilk. Combine the brown sugar, chopped walnuts, and ½ tsp cinnamon. Sprinkle over the top of the muffins. I've taken the next two days off or some Black Friday shopping. The plan is that we will be across the border later this evening and hitting the stores at midnight. If all goes well we should be home before noon tomorrow. There isn't anything that compares with a Black Friday shopping experience - heck people have been killed (seriously, folks have died) in the mad rush to a deal. I have seen women punching one another because one thought the other had cut in the line (turns out her BF had been there all along with their cart) . . . people screaming hysterically when the store was out of a particular item . . . shoving . . . the worst fashion EVER. All of this aside, it is greta fun if you don't mind standing in line waiting to pay. It does take a certain amount of stamina to face. in order to help my friends and I cope I was up early this morning and baked up some muffins. I had bananas that needed to be tossed into some sort of baking so banana muffins were on order. I found this recipe on the Simply Recipes site. Muffins are a funny thing - I love to eat them and every time I bake some I wonder why I don't make them more often since its so easy. There are few baked goods that are mixed and in the oven as quickly. These ones came together quickly and baked up beautifully. Mix in the sugar, egg, espresso and vanilla. Add the flour, mix until it is just incorporated. Fold in the chopped walnuts. Pour mixture into a prepared muffin tin. Bake for 25-30 minutes. Check for doneness with a toothpick inserted into the center of a muffin. If it comes out clean, it's done. Cool on a rack. The other day a colleague and I were making a long drive for a meeting. Since we had such an early start we decided to bring some treats for the car. I wanted to make ricotta muffins because I had some ricotta that needed to be used. I also had some Meyer lemons in the fridge. Throw in some raspberries that ALSO needed to be out of the fridge and I had a plan. With my good friend google I consulted the great cookbook known as the internet where I found a great sounding recipe for Lemon Ricotta muffins. The recipe was by Giada de Laurentiis so normally I would run for the hills, however it hit all of the right buttons so I persevered. Raspberries were not included in the recipe but 'how hard would it be to toss some in?' I thought. I love what ricotta cheese does to baked goods. It lightens, and fluffs, and imparts such a lovely consistency to the batter. I had had a lot of success adding it to our favorite pancake recipe, so I was almost positive this recipe would prevail. And whatever you do, don't substitute for the almond extract. The intense flavor it provides works so beautifully with the fresh lemon. This was an easy recipe to follow and the resulting muffins were incredible - definitely a new favourite for me! In fact, when we got back my colleague grabbed the leftovers and ran. Good thing I had 6 left at home to share with Paolo. Line 12 muffin cups with paper liners, and preheat your oven to 350 degrees. Whisk the flours, baking powder, baking soda, and salt in a medium bowl to blend. Using an electric mixer, beat 1 cup sugar, butter, and lemon zest in a large bowl until light and fluffy. Beat in the ricotta. Beat in the egg, lemon juice, and almond extract. Add the dry ingredients and stir just until blended (the batter will be thick and fluffy). Using an ice cream scoop, divide the batter among the prepared muffin cups. Sprinkle the tops with almonds and then the remaining 1 teaspoon of sugar. Bake until the muffins just become pale golden on top, about 22-24 minutes. Cool slightly. Serve warm or at room temperature. With all of the snow we have been having lately we feel the need for treats. On Sunday Paul was out shovelling (thank goodness for our neighbour Bill's comment about Paul hiding under a shrub every time it has snowed this year. Paul was guilted into action. Go Bill!) and likely cranky.It was cold and nasty out. I took pity on him and decided to bake a treat for breakfast. Yes, he is spoiled. Because the car wasn't getting out of the driveway I had to make do with what I had on hand. I found this recipe on-line at the Cooking Light web site. These muffins came together quickly AND they are low in fat. The cream cheese and buttermilk gave them a wonderful tangy taste. I used some of the raspberries that I froze in July - anything for a taste of summer. Last weekend I mentioned that I had some ripe bananas and rather than throw them out as I usually do I planned on baking something with them but I didn't know what. For awhile it looked as if I would never get to bake anything with them because mom was trying to sneak them out of the house so she could make Banana Bread. By yesterday they were REALLY ripe! I ended up making some low-fat strawberry banana muffins which allowed me to use up the bananas as well as some strawberries which I had in the fridge. Preheat oven to 350 degrees F (177 degrees C). Position rack in center of oven. Line the muffin pan with paper liners or grease with butter or a vegetable spray. Set aside. In another large bowl combine the flour, baking powder, baking soda, cinnamon, and salt. Gently fold in the berries, making sure they are coated with flour. This helps to prevent the berries from sinking during baking. Do not over mix or the berries will end up coloring the batter. Add the wet ingredients to the dry ingredients and stir only until the ingredients are just combined. Do not over mix the batter or tough muffins will result. 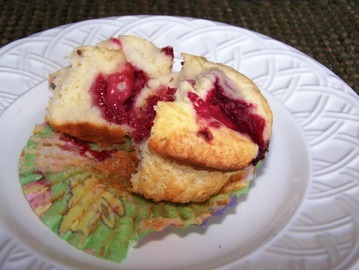 Fill each muffin cup about two thirds full of batter, using two spoons or an ice cream scoop. 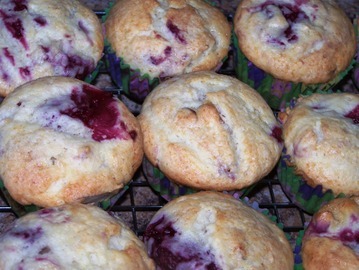 Fill any unused muffin cups halfway with water to prevent warping of the pan and/or over browning of the muffins. Place in the oven and bake until a tester inserted in the center of a muffin comes out clean, 20 to 25 minutes. Transfer to a wire rack to cool.